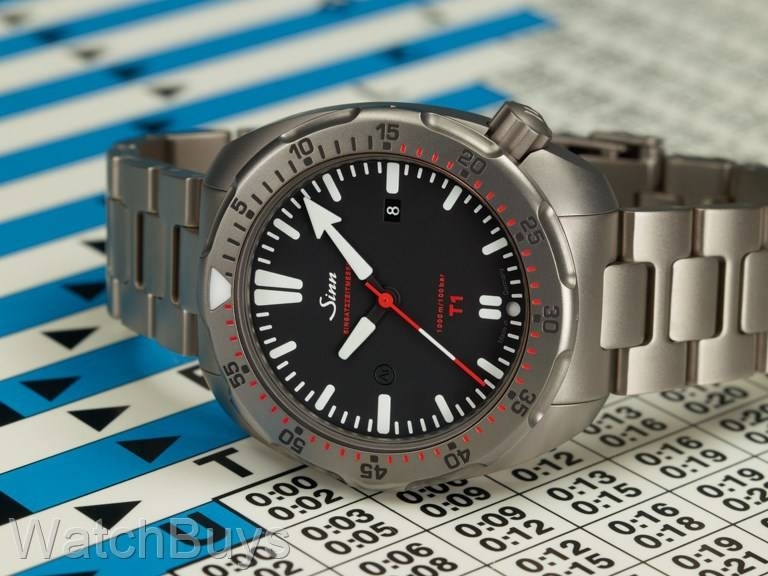 In recent years Sinn has developed a quite well-deserved reputation for making outstanding dive watches, largely due to the success and popularity of their U-series dive watches, whose cases are also constructed of a special material - German U-boat steel. On top of the titanium case, an additional feature of the T1 EZM 14 is Sinn's Tegimented unidirectional captive safety bezel which features a unique design to ensure that the bezel cannot detach from the case or be rotated inadvertently. In other words, the bezel is held onto the case by a series of screws, and must be depressed before it can be rotated around the dial. Additionally, the T1 EZM 14 also features a number of technologies unique to Sinn that will ensure years of reliable service. This includes the Tegimented Captive Safety Bezel System mentioned above, but also their Dehumidifying Technology which uses a copper-sulfate desiccant capsule and inert gas to keep oxygen and moisture from entering the case in order to prevent the premature degradation of the lubricants and oils. 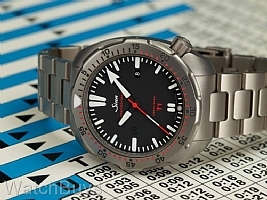 These oils and lubricants are special as well, as Sinn has designed them to provide reliable operation in extreme temperature environments, from 45 C up to + 80 C.
The T1 EZM 14 features a matte black dial with date at 3, Super Luminova on the hands and markers, and a striking red seconds hand. Other features include a sapphire crystal with an anti-reflective coating on both sides, and a matching titanium bracelet. Verified Owner Comments: Very happy with my purchase. Customer service was impeccable, and shipment was very quick. Would not hesitate to use this company again. Verified Owner Comments: I recently purchased my T1 and love it. Initially, I was hesitant of making the purchase because of my 7" wrist. I saw where the T1 was about the same size as a U1, which I have, so I made the purchase. I'm glad I did. It fits great. No overhang off the wrist, it's light as a feather, the dial is easy to read and the red and white second hand grabs your attention for easy timing, if needed. As with all Sinn watches, the bracelet is extremely easy to adjust with the included allen wrenches. Sinn and their technology have done it again. Don't hesitate, just get one, you won't regret it. "Sinn T1 with Titanium Bracelet"
Verified Owner Comments: The titanium does make the watch very comfortable to wear daily. I was initially concerned the 45 mm diameter would be too large for my 6.75 inch wrist but after 1 month I'm quite happy with its size. An all tegimented version would be nice, but the titanium grade 5 is already quite hard.